We are flirting with the edge of frost. The air chills noticeably as soon as the sun dips low behind the spindly ten-leaf trees. Perhaps the dew has already frozen on our patch of garden, presenting us with a transient coverlet of lace as harbinger of what’s to come. And, still, some bees are flying. A last few honeybees fly in and out of the brilliant whiskered mouths of the last nasturtium caves. 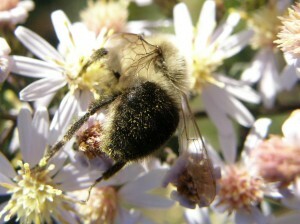 Huge ground bees stand stunned on aster centers like locomotives rolling to a stop halfway across a prairie. However, that doesn’t prevent me from anthropometaphorizing insects. These bees are bound to die. As am I. But these tiny engines of life, slowing in the cold, continue to perform the tasks that were their life’s work through their warmer days. I have no way of knowing whether the last drops of nectar are sweet to the bee that ends her life sipping them, but I am stirred by the sight of her relentless quest. Nothing seems as beautiful as the last flowers of fall and no insight more important to me than that we are alive every moment until the moment we are not. We welcome SHARRON COHEN as Honorary Guest Blogger. Sharron is an extraordinary photographer of insects (see her BEE PHOTOS in the album section of the website) and she promises to weigh in from time to time to update us on her adventures in the insect world.